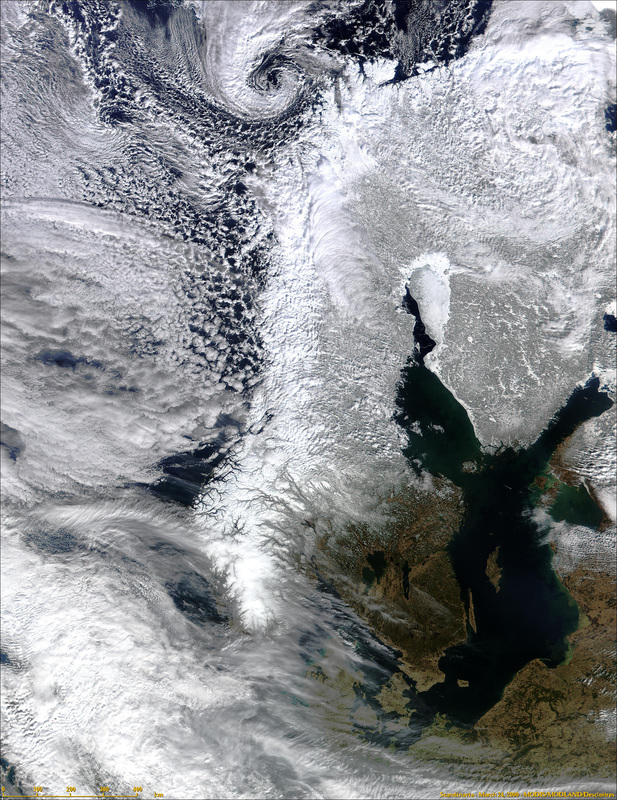 Views from space over the Scandinavian region. Look at all the snow! Thanks for posting these...these are some amazing images. In the third to last pic, at the very top in the middle, what is that cyclone thing? a storm i would imagine. a scandinavian hurricane perhaps? Thats a old low pressure from a storm or a hurricane system. In that image you can actually find three of them over Scandinavia. Most of them is old hurricane system from south atlantic which has also hit the US. On they way north they gets weak, but is still a hurricane or a storm system when it hit the Norwegian coast. But they dies quite fast after they hit the Norwegian mountains. Don't forget that the North Sea area has very intense storms, and that those hurricanes are just really strong low pressure systems. So naturally they woudl look similar. Yes, hurricanes is not that usually here, perhaps one big each 10th year, and a few smaller hurricanes each year or each second year. Last year we had 3 smaller hurricanes though. But large intense storms hit us whole the time. So far in december 3 storms has hit Norway, the strongest earlyer this week with wind up to 35m/s, which is hurricane winds. This has caused demage, and hundreds of closed roads and isolated villages because of avelanches and stone slides. Those clouds patterns is called "vortex streets" and is common when low winds blowing over the flat sea surface are disrupted by some obstacle such as an island. Jan mayen is a island with one tall mountain, Berenberg. Berenberg is 2 100m tall as far as i know and is the northern most active vulcano in the world, and the only active vulcano in Norway. Jan Mayen don't have any innhabitants, but you find ppl there whole year. They study artic climate, artic weather and the islands geology and vulcano activity. Here is another Vortex street image from Jan Mayen. Extraordinary images. I try to find similar ones for my region. Thanks for posting them, Christian.